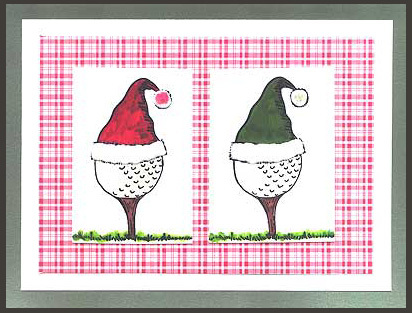 “Golf Ball Santa with Border” is stamped twice on white glossy card stock using a black Memories pad and both are colored with watercolor markers, coloring one hat red and one hat green. The border of the stamped image is removed with scissors. Diamond Glaze is applied to the golf ball area to give a raised and rounded look to the ball. White Liquid Applique is applied to the trim of the hats and tassels, then heated to puff. A little color is placed on the tassels to match the hats. Glue is applied to the trim on the hat and white flock is applied with tweezers. These two pieces are layered over scrapbook paper, then white and green card stock. Card by Thalia Sledge.